Patients should bring all of their medications for asthma and for other conditions, (including eye drops and nasal sprays) to each review. Watch patients use their inhaled medications and assess technique. Involve patients in the choice of devices when possible. Aim for the least number of inhaler device “types”, to avoid inhaler device polypharmacy. With the patient write or get the patient to write out all of their severe asthma medications / or use pictures; ensure they understand what each medication is for, and when and how long to use each one. Make a copy for the patient to keep. Use their own asthma medications to talk about how each medication class works. 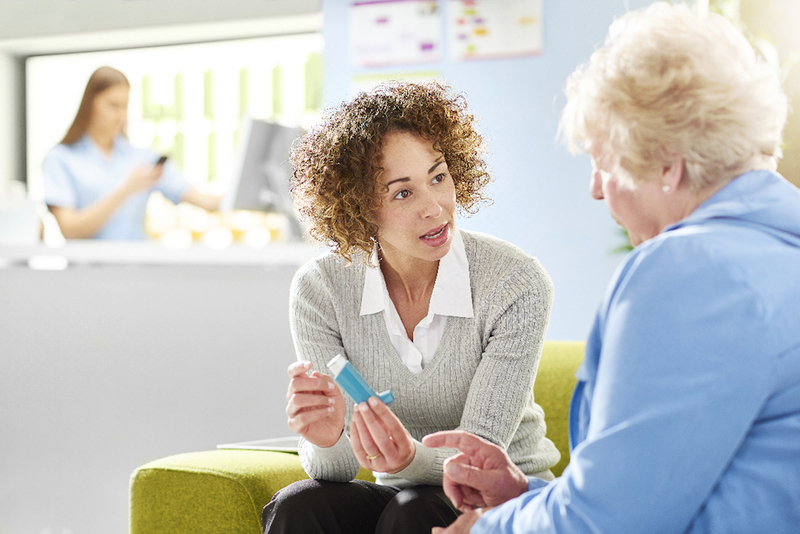 Provide advice about the risks and benefits of asthma medications. Check for any medication side effects, including of high dose inhaled corticosteroids and high dose beta-agonists (short-acting and long-acting). Offer advice to minimize side effects (e.g. spacer for pMDI’s, switch accuhalers to pMDI’s via spacers, rinsing mouth after all ICS, handihaler to respimat, avoiding overuse of short acting bronchodilators). Check for side-effects of oral corticosteroids, including mood effects, weight gain, osteoporosis, cataracts etc. Acknowledge the frustration some patients may feel taking a lot of medications and still experiencing frequent symptoms and flare ups. Discuss the cost burden some patients may have with multiple asthma prescriptions and that this may impact on adherence. If available, the generic version of some medications may be less costly and shopping around local pharmacies for best prices can be helpful. Education commences when patients are being assessed for the medications. Monoclonal antibodies work by blocking the activity of some of the immune system molecules that trigger inflammation in the airways. This reduces the chance of asthma attacks / flare-ups, and in some patients, reduces the frequency of asthma symptoms. Explain to the patient that there are very specific requirements for obtaining these medications through the Pharmaceutical Benefits Scheme (PBS) system. For more information see Monoclonal Antibodies. Use comprehensive medication-specific patient information booklets from peak bodies or the relevant manufacturer. These booklets describe the action of the medication and possible side effects. Inform patients approved for subsidised treatment that it is important to see the same respiratory physician for initial assessment. Assessment must be face to face and not by phone. Explain to the patient that improvements in asthma control or a decrease in oral corticosteroid dose are required to qualify for continued access to treatment (beyond 6-months). Recommend taking prescriptions to the local pharmacy up to a week in advance to allow the pharmacist time to order the medication from suppliers. These are not stock items. An alternative is to leave the prescription with the pharmacist, and prompt the pharmacist of the order by telephone. The first three doses will be administered in a severe asthma centre, tertiary care facility or respiratory physician’s rooms and patients are closely observed post injection. This is a precautionary step, as in rare cases anaphylaxis has been observed post injection. Explain to the patient the requirement to stay for an observation period after the injection. Inform the patient of the need to keep medications refrigerated from 2-6°, until they are administered. Advise the patient that ongoing doses need to be administered where access to medical care is available; usually their General Practitioner (GP). Patients are not able to self-administer or have family members administer the medications. ASCIA Anaphylaxis Plan available here. At the commencement of therapy, involve patients in discussion of frequency of doses and length of macrolide treatment. Provide education about not taking antacids simultaneously with macrolides. Advise patients to immediately report any hearing or balance changes that occur after they commence therapy. Discuss the possibility of side effects: the most common are nausea, vomiting, diarrhoea and abdominal pain. Ensure that the patient is aware of the need for ongoing reviews to evaluate therapy effectiveness.